AMT Marine Software Inc. (AMT) has commissioned Autoload loading computer software on another Austral Asia Line’s (AAL) new build ship m/v “AAL Fremantle”. The m/v “AAL Fremantle” is the first ship in a series of 4 multi-purpose sister-vessels of 19,000 DWT and 700 MT heavy-lift capability (the "S-Class”) being built at Sekwang Shipbuilding Co., Korea. These vessels will be deployed in AAL Asia – Australia West Coast Service catering for break bulk, large-dimensional and heavy-lift project cargoes as well as bulk commodities and containers. Autoload is the market-leading onboard stability and stowage planning software developed by Autoship Systems Corp. which in one application integrates graphical cargo planning and advanced stability analysis tools. 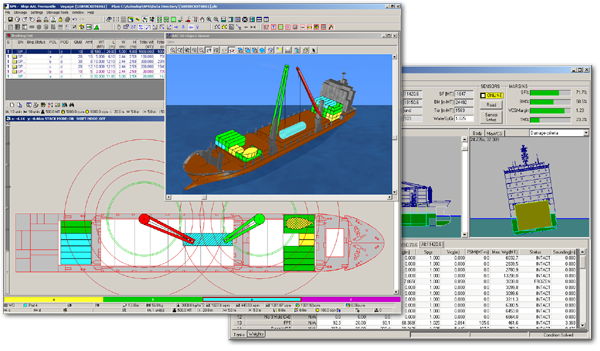 The users of Autoload can re-configure positions of tweendeck panels and in 3-dimensional graphical view simulate lifting and precise positioning of oversized and overweight cargo with one or two heavy-lift cranes, while controlling the crane’s outreach, SWL, lifting parameters and in real time monitoring ship’s hydrostatics. In cooperation with our Korean partners NET Co. Ltd. (www.netjoiner.com) we have delivered a turn-key loading computer system that includes both software and type-approved computer hardware. The loading computer is linked to PANASIA tank and draft sensors system that allows real-time monitoring of ship’s loading condition and floating status. The model of “AAL Fremantle” has been added to the ship models database in Autoload installations in the AAL regional offices. It is used by shore stuff for cargo estimates and preliminary ship planning. Having the same loading software on board the ship and in the operational offices makes the cargo planning process transparent, better coordinated and efficient. Contact info@amtmarine.ca for more information.